US Army Brigadier General Michael Nagata on Thursday told the mediathat US military contribution in Pakistan’s northern area, which includes the Upper Dir, Swat Valley and Kohistan regions, currently includes 230 soldiers, sailors, airmen and Marines and 19 helicopters. Four Air Force and Marine Corps C-130 cargo planes are delivering supplies in other areas of Pakistan, Nagata said. He said the Pakistani military has shown tremendous cooperation, support, and friendship toward the US forces in providing flood relief in northern Pakistan. “The collaboration, the cooperation, the support, the protection, and the friendship, and I use that word very deliberately, extended to us by our Pakistani partners has been nothing but impressive,” said Nagata. “This is one of the best examples of combined collaborations among military partners that I’ve ever seen,” Nagata said. Working out of a large hangar and two other sites in northern Pakistan, the aircraft and crews are mostly delivering bulk food items, such as flour and rice, as well as cooking utensils and potable water systems among other things, Nagata informed. AmeriCares has delivered more than $500,000 to the flood affected areas of Pakistan, and is continuing to deliver critical medicines, medical supplies and other lifesaving aid to flood victims. “Since 1990, we have delivered nearly $57 million in assistance to the people of Pakistan. But as the situation in Pakistan becomes worse and worse, more sustained effort is required to minimize the destruction, disease and loss of life,” said an AmeriCares official on Thursday. 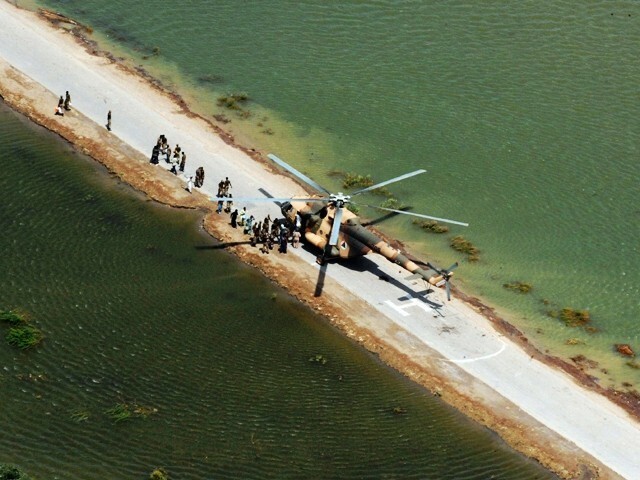 The Government of Japan on Thursday dispatched a Japan Disaster Relief Team to operate six helicopters of the Self-Defense Forces (SDF) including CH-47 and UH-1 to conduct rescue and transport activities in Pakistan. Japan has so far extended approximately $ 14.6 million emergency grant assistance and relief goods for those affected by the floods. In continuation with the flood relief assistance being provided by China to Pakistan, a medical team comprising 60 doctors and paramedics, left for Pakistan on Thursday. The team is took along a mobile hospital for providing immediate relief to the people, said a press release received from Beijing, China. Three C-130 aircrafts of relief goods from Egypt arrived in Pakistan on Thursday. The Egyptian government has decided to send another three C-130 Cargo planes containing humanitarian assistance soon. According to press release this assistance consists of tents, medicines and dry food items. Each cargo plane that shall arrive consecutively on coming Friday, Saturday and Sunday and the embassy of Arab Republic of Egypt is coordinating with the National Disaster Management Authority (NDMA) to hand over the assistance. Turkish Exporters’ Assembly and the Turkish Red Crescent signed a protocol in Ankara to launch an aid campaign for Pakistan. TIM chairman Mehmet Buyukeksi said that exporter unions have started the campaign by donating one million Turkish liras. Turkish authority said on Wednesday that some 18 million Turkish liras have been collected in bank accounts within the scope of an aid campaign aiming at helping flood-hit Pakistan. Right after the disaster, Turkey had sent eight cargo planes full of nearly 244 tons of medicine, food, clothing, two mobile hospitals and 40 medical personnel to Pakistan.